A lone Joshua Tree in Joshua Tree National Park. 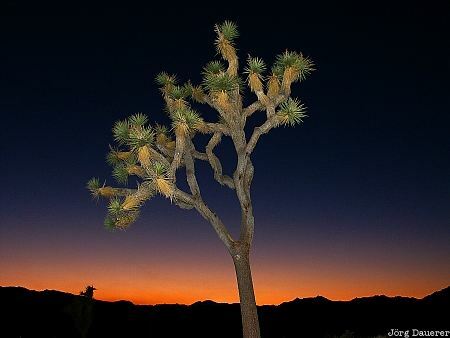 Joshua Tree National Park is in southern California in the west of the United States. This photo was taken shortly after sunset on a hot day in October of 2002. I waited until the sun had set behind this tree and the sky had a nice color. The tree partially illuminated by a flash gun (used as a fill flash). This photo is part of the exhibition Fill Flash (June 2016). This photo was the image of the month in October of 2010. This photo was taken with a digital camera.